A look below the top of the podium at the CrossFit Games. 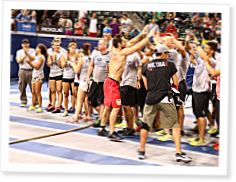 Rich Froning was high-fiving volunteers on the evening of July 26. It had been one of the longer days of competition, with athletes starting just after noon with the Muscle-Up Biathlon and ending around 9 p.m. with the Push Pull. Froning had spent the afternoon and evening digging out of a hole created by a poor performance a day prior, when the fittest man on the planet had looked beaten, sluggish and all too human. So poor was his performance—at least by the shining standards he’d set in previous years—that many had written the champ off, taking to Facebook and Twitter to post king-is-dead proclamations. Froning was in the fiercest fight of his career, and he was under the weather—something he revealed to media only after he came back to win the CrossFit Games. He had every right to duck out of the stadium to rest up for a showdown with Mathew Fraser on the final day of competition. But long after other competitors and most fans had left the tennis stadium, Froning was still there, shaking hands with an army of volunteers, posing for pictures, thanking people for their contributions to the sport, the community and the event. Indeed, Froning remembers the giants. Mike Warkentin reports that a Finnish firefighter and a Pennsylvania phys. ed. teacher are the Fittest Man and Fittest Woman in the world.